Unload your adrenaline with the Bikepass Free offer in Livigno, for a holiday in the apartment in total freedom. Unload your adrenaline with the Bikepass Free offer in Livigno, for a holiday in the apartment in total freedom. If you travel with family or friends in Casa Rosalba you can find spacious three-room apartments from 4 to 7 people. With a minimum stay of 7 nights and the Bike Pass you can cycling with MTB on both sides of the mountains (Mottolino and Carosello 3000) and it is included in the price! 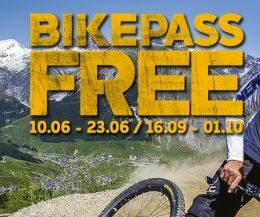 The promotion with Bikepass Livigno is valid from 9 to 22 June and from 15 to 30 September and is reserved for all downhill and free ride lovers. Book the cheapest rate now! Choosing the mountain bike offers in Livigno and Valtellina you will have a wide choice of trails. Livigno is a strong attraction for lovers of two wheels and is considered one of the capitals for mountain biking as it offers trails of different difficulties for downhill and freeride, bike path along the country and bike-skill center. By purchasing the Bikepass Livigno, you will have the possibility to use the Mottolino and Carosello ski lifts, there are no age limits, you can also rent a bike and ask for the support of a specialized mountain bike guide from Livigno. What are you waiting for? Book now the holiday in apartment in Livigno!